Skaneateles bed and breakfast travel guide for romantic, historic and adventure b&b's. 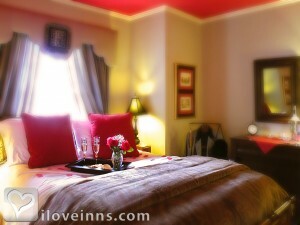 Browse through the iLoveInns.com database of Skaneateles, New York bed and breakfasts and country inns to find detailed listings that include room rates, special deals and area activities. You can click on the 'check rates and availability' button to contact the innkeeper. Thousands of visitors and sightseers pay the beautiful town of Skaneateles a visit because of its amazing views and relaxing environment. A historically significant town, there are several gift shops, galleries, restaurants, and even Skaneateles bed and breakfasts right at the heart of the town.Since the town of Skaneateles is cradled by a jewel clear lake in Central New York, the primary attraction is related to water sports and recreation. People come to Skaneateles to go boating, fishing, or swimming. If boating is your passion, then you will be very delighted to know that Skaneateles has a number of boating services and boating docks available. You can check out the Skaneateles Town Boat Launch, the NYS Public Boat Launch, or the Skaneateles Chamber Community Docks. By Aunt Louise's Lake House B&B. Situated in central New York state in the Finger Lakes Region, Skaneateles is most known for it's exceptionally clean lake. Skaneateles is the cleanest of the Finger Lakes and is one of the cleanest lakes in the country. The charming Village offers exceptional shops and restaurants all in a walkable downtown area along the coast of the North end of this crystal clear lake. Historic homes, galleries, shops and fine dining will not leave you disappointed with your choice in a vacation spot as you will follow in the foot steps of some famous visitors such as past presidents. Wineries nearby include Anyela's Vineyard and Beak and Skiff Orchards as well as the Cayuga Wine Trail beginning only 18 miles away. Live theater at Merry-Go-Round theater in Auburn, Skaneateles Festival with world-class musicians, Barrow Art Gallery and our local community band round out just a few of the arts you may enjoy during your visit. Enjoy the Antique Boat Show, Dickens Christmas, or just come to town to enjoy it's beauty and relax. By 34 State "Historic Luxury Suites". Skaneateles is known for its beautiful lake that is the 2nd cleanest lake in the US! There are excellent restaurants and shops in the quaint village to explore during your stay. Take a boat trip on the Judge Ben Wiles and see the stunning homes and shores of this gorgeous location. By 1899 Lady Of The Lake. Skaneateles is in the Finger Lakes region of central New York State and is located on the norther tip of Skaneateles Lake. Skaneateles Lake is the 3rd cleanest lake in the country and feeds Syracuse and the surrounding area with it's drinking water with only filtered water and no chemicals added. There are many wineries such as Anyela's and the Cayuga Wine Trail in the region in which we can arrange private wine tours for you. The Village itself offers an array of quaint shops such as Pride and Joy a specialty children's store, Skaneateles 300' a women's boutique, F. Oliver's a olive oil and balsamic vinegar shop and Kate and Sally's an upscale woman's clothing store. There is a gallery only one block away featuring the artwork of the famed John D. Barrow artist. Many historic sites are near by also such as Harriet Tubman's house, William Seward's house and also the collective items at the Creamery. By 34 State "Historic Luxury Suites".